Givat HaMivtar (Hebrew: גִּבְעַת הַמִּבְתָּר) is an Israeli settlement and a neighborhood in East Jerusalem established in 1970 between Ramat Eshkol and French Hill. It is located on a hill where an important battle took place in the Six Day War. Archaeological excavations have revealed important ancient Jewish tombs in the region. Givat Hamivtar was one of the first "Build Your Own Home" neighborhoods in Jerusalem. 2.2 Tomb of "Simon, builder of the temple"
The hill on which Givat Hamivtar was established was the site of a Jordanian fort, one of a series of military installations blocking Jewish access to Mount Scopus and cutting off Hadassah Hospital, the Hebrew University, and the National Library of Israel from West Jerusalem.[when?] The Jordanians called it Tal al-Mudura, lit. "round hill." Jordanian snipers used this strategic location to fire on Israeli troops during the Battle of Ammunition Hill. 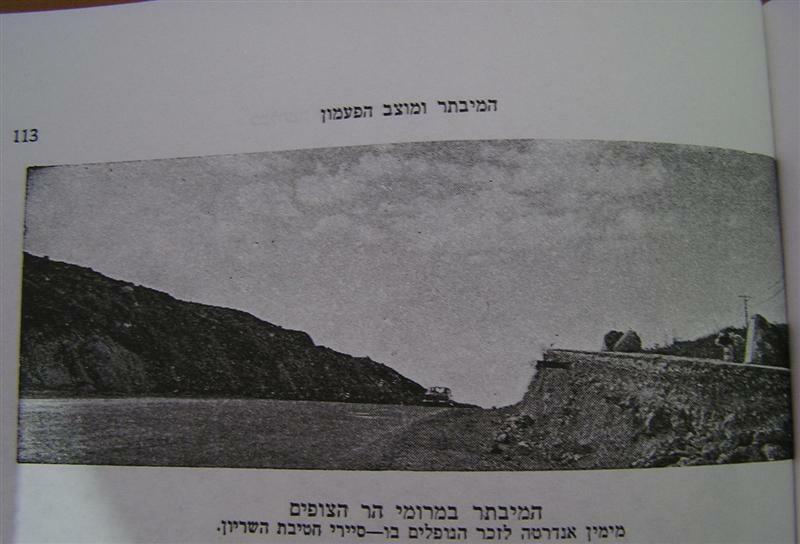 Givat HaMivtar was conquered by an Israeli tank force after two attempts. The first mission failed after an Israeli soldier was killed by friendly fire. The Jerusalem neighborhood of Givat Hamivtar was planned as part of a sequence of Jewish neighborhoods called the bariah or "hinge" neighborhoods connecting west Jerusalem to Mount Scopus. The name of the neighborhood means "bissected hill," either referring to the crisscross of Jordan bunkers that existed before the neighborhood was built, or the earthworks cutting through Mount Scopus to create a road from Jerusalem's Old City to Nablus. In July 1967, Prime Minister Levi Eshkol ordered government clerks to bypass the ordinary procedures to allow for Givat HaMivtar and the other hinge neighborhoods to be built as quickly as possible. When purchasing land encountered difficulties, some tracts were expropriated. To speed up the building process, land was subsidized by the government. Most of the homes in Givat HaMivtar were privately built. The majority of the homes were two-family homes, originally one-story high, to which a second and often a third floor was added over time. Numerous archeological digs have been carried out in Givat HaMivtar. Sepulchers discovered in the course of the digs were determined to be Jewish tombs of the Second Temple period. One tomb yielded the only physical evidence for the Roman custom of crucifixion found to date. These were the remains of a person called Jehohanan Ben Khagqol, and they included a heel bone with a nail driven through it from the side. The tip of the nail was bent, perhaps because of striking a knot in the upright beam, which prevented it being extracted from the foot. Tomb of "Simon, builder of the temple"
Another tomb, highly ornate, held the remains of the family of "Simon, builder of the temple" (Simon Bana Hekhalah), probably a builder of the Herodian Temple, as his name indicates. A third archaeologically interesting tomb on Givat HaMivtar is that of "Abba, son [descendant?] of the priest Eleazar, son [descendant] of Aaron the high (priest)." The inscription is in Aramaic, but written in the by then anachronistic ancient Hebrew script. In the tomb prepared for his family, Abba, who had been exiled to Babylon, secretly brought back to Jerusalem and buried the remains of "Mattathiah son of Juda(h)". Some believe that Mattathiah son of Judah was Antigonus II Mattathias, the exiled heir of the Kingdom of Judea. However, according to anthropologist Joe Zias, former Curator of Archaeology and Anthropology for the Israel Antiquities Authority, this theory is just little more than an urban myth, since the only beheaded skeleton found in 1971 and at the later reexamination of the previously untouched tomb, belonged to an elderly woman. In his view, no other set of remains found there could be associated with King Antigonus II. Givat HaMivtar has only preschools and kindergartens. The elementary schools of Ramat Eshkol were built on the border between the two neighborhoods in order to serve them both. High schools are located on French Hill and Ma'allot Dafna. The first synagogue in Givat HaMivtar was unique in that prayer services followed a non-specific nusach so that Jews of all ethnic groups could pray there. In the first decade of this millennium, many of the neighborhood's secular and Modern Orthodox residents have moved out, and ultra-Orthodox Jews have become a majority. Since the mid-1980s, there is a Makuya center in the neighborhood. ^ "Settlements in East Jerusalem". Foundation for Middle East Peace. ^ a b c d e Kroyanker, David (1988). ירושלים - המאבק על מבנה העיר וחזותה [Jerusalem - The struggle over the city structure and its appearance] (in Hebrew). Zmora Bitan. ^ "Ammunition Hill" (in Hebrew). Archived from the original on 17 June 2011. ^ שער ראשון "אם אשכחך" [The first gate, "If I forget thee"] (Microsoft Word doc) (in Hebrew). Israel Ministry of Education. Retrieved 29 August 2014. ^ Moshe Meir (30 April 2006). אבי אבי [Avi Avi]. Haaretz (in Hebrew). Retrieved 29 August 2014. ^ Uri Milstein (6 June 2002). קרב גבעת התחמושת כמשל [The battle of Ammunition Hill as a parable] (in Hebrew). Faz. Retrieved 29 August 2014. ^ המיבתר במרומי הר הצופים [HaMivtar atop Mount Scopus] (in Hebrew). The earthworks cutting picture, early 1970s. ^ David W. Chapman (2008). Ancient Jewish and Christian perceptions of crucifixion. Coronet Books. pp. 86–89. ISBN 9783161495793. ^ Merit Selvin. מעשה הצליבה [Crucifixion] (in Hebrew). Retrieved 25 August 2014. ^ Samuel Safrai. ארץ - ישראל והתפוצה היהודית : ה. העלאת מתים לקבורה בארץ - ישראל [The land of Israel and the Jewish diaspora: Raising of the dead for ritual burial in the land of Israel] (in Hebrew). Retrieved 29 August 2014. ^ אילת נגב בראיון עם אמילי עמרוסי [Eilat Negev interview with Emily Amrussi] (in Hebrew). May 2009. Retrieved 29 August 2014. ^ Avishai Ben Haim (8 February 2005). אדיר זיק הובא למנוחות [Adir Zik was laid to rest]. Maariv (in Hebrew). Retrieved 29 August 2014. ^ Tamar Rotem (20 February 2008). "Beit Hakerem - The last secular holdout in Jerusalem". Haaretz. Retrieved 29 August 2014. Ronit Mizrahi; Mirav Shalom (28 April 2009). בגובה העיניים עם שלמה רוזנר, [At eye level with Shlomo Rosner] (in Hebrew). NRG. Retrieved 28 August 2014. ^ מרכז המקויה בירושלים [The Makuya Center in Jerusalem] (in Hebrew). Retrieved 29 August 2014. Wikimedia Commons has media related to Giv'at HaMivtar. This page was last edited on 13 November 2018, at 19:04 (UTC).